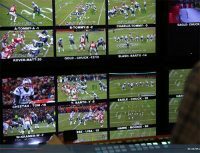 Replay producer Ryan Galvin knows that for every play he had just three seconds to choose which of those camera angles to air as an instant replay. There’s a digital tape machine for every camera. And each one has a name like leopard, Charlie, eagle which he has memorized with a hand-written map. 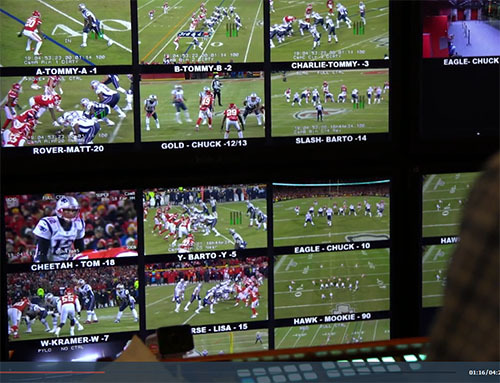 Galvin has the help of 36 technicians who are controlling and watching all the camera angles. The very first instant replay was in 1963 at the Army Navy game. In the 4th quarter Army was on the one yard line. The quarterback flipped over the line and made the score and this was the very first instant replay. Ironically the tape of that historic moment no longer exists. The TV viewers who saw that first instant replay thought that Army may have scored twice. They had never seen an instant replay before. It’s just so funny and silly like a food fight in tuxedos. And it sells the idea of the fun of football. Unfortunately this commercial was much more entertaining than the game itself. The second one “Google’s Jobs For Veterans” shows what you can do with simple close-ups of paper forms. The visuals couldn’t be any easier to produce. It’s a powerful ad that relies on minimal visuals. As a video producer, think about how this approach could be used in a commercial or promotional video you produce. It is the script and sound track that makes this one so powerful. You can get a lot of mileage from this concept. Want to see some more funny SuperBowl Ads? 10 Funniest Superbowl Ads from the past.